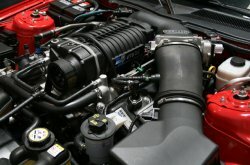 Lysholm 2007-2009 GT500 Mustang Supercharger Tuner Kit  : Supercharger Superstore, Your Online Source for Vortech Superchargers, Paxton Superchargers, Procharger Superchargers, Magnacharger Superchargers and Techco Superchargers! Designed for use with the 5.4L 4V engine in the ‘07-‘09 Mustang GT500. Features the Lysholm 3300 twin-screw supercharger with 4.0” driven pulley and new 10-rib drive belt. Compatible with “tall” fuel injectors and aftermarket fuel rails. Replacement belt: 2A041-880 (Dayco 5100880). Compatible with all three pulley sizes. Not smog legal in California (off-road use only).